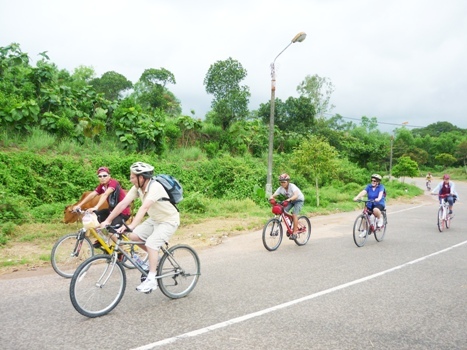 GOKOVA offers half or full day, multi-day and customized bike tours & holidays. We do tours for every ability level from the first time leisure rider to advanced single track rider. Scenic Family Tours (SF): These tours are suitable for all ages and ability levels. The emphasis of these rides is to take in the scenery at a relaxing pace. Your guide will interpret the local landscape and share the natural & cultural history of the area as you ride on paved and/or dirt roads through our national park and forest. Intermediate Popular Tours (IP): These tours are suitable for the active-athletic persons. The essence of these rides is learning some basic mountain bike techniques while riding on dirt and gravel roads with singletrack trail options. These routes are longer and involve more climbing. Advanced Challenging Tours (AC): These tours are suitable for the advanced experienced mtb rider. The focus of these rides is the "right' mountain bike terrain whose routes involve two-track and singletrack trails. The distances are variable but the climbing and descending is for sure. An easy day through the Aegean culture, fruit gardens and local life. 10 km downhill from Sakar Hill with an amazig view of Sedir Island and Gökova Bay. Up and down around the lake to thermal springs village. Then boat trip to Dalyan. An unforgettable tour from the end of the penninsula to Akyaka. One of the best routes all around. Cruising through the creeks of Akyaka and Akçapinar. Amazing environment and mostly shallow water. Where does the trip begin? At our base in front of Yücelen Hotel. What are the highlights of this trip? This tour is suitable for all ages and ability levels. The emphasis of this ride is to take in the scenery at a relaxing pace. Your guide will interpret the local landscape and share the natural & cultural history of the area as you ride on paved and/or dirt roads through our forests and villages.. Anyone in relatively good physical condition, who does not possess medical problems. We leave every Thursday (09:00 am) from May to October, with a minimum of 2 participants from our base. We follow the roads between the villages. The track mostly goes under pine trees. We make a big loop around Gökova Plain. Stop by the best scenic points by the way. Taste some traditional courses in Akçapinar Village. Amazing view of Gökova Gulf and Sedir Island. This is an intermediate tour. 12 km of Downhill on offroad is not for everybody. Your hands might ache because of using brakes or arms while going downhill. Our guides change the speed of the tour according to the physical condition of the group. Anyone in relatively good physical shape, who does not possess medical problems and who wants some excitement while paddling. We leave every Wednesday (10:00 am) from April to November, with a minimum of 2 participants, from our base. Transfer to the summit of Gökova Cliffs. After a short brief we start paddling trough the villages of the high plato. On the 8th km we turn left from Kiran Village down to Gökova Gulf and best part of tour starts with an amazing scenery. When we reach sea level in Turnali, we stop for lunch. After lunch keep on paddling by the coast to Akyaka. Stop in Çinar Beach for a swim. Finish at 17:00 pm in Akyaka. This trip has been done for ages, on foot, by horse or by bike. The Dalyan Channels between the lake and the sea is a world famous national park. This tour is suitable for the active-athletic persons. The track is 32 km. The essence of this ride is to learn some basic mountain bike techniques while riding on dirt and gravel roads with singletrack trail options. These routes are longer and involve more climbing. At Dalaman Airport! We pick you up from there. Experience the beauty of Gökova Region and get closer to Aegean culture. This trip is for the one who can paddle 40 km per day. We use MTBs and follow mostly the back roads. Anyone in relatively good physical condition, who does not possess medical problems, and who has a desire to experience a different side of Aegean Coast. Day-1/ Transfer from Dalaman Airport to Yücelen Hotel in Akyaka. First meeting and introducing guides, gear and Akyaka. Day-2/ Akyaka-Bördübet / Transfer to Çetibeliby car and start pedaling to Çinar, Bayir, Karaca (39 km). Rest in heaven-like Amazon Camp. Day-3/ Bördübet-Datça / After breakfast bike to Alayar, Emecik, Kizlan arrive at Uslu Apart by the sea in Datça (48 km). Day-4/ Datça-Knidos-Palamutbükü / Hizirsah, Zeytinlik, Yakaköy and Knidos are on our route. Break in Knidos ancient city (the end of peninsula). Bike to Gabaklar Pension in Palamutbükü Beach. Day-5/ Palamutbükü-Hisarönü / Follow the main road to Marmaris with the scenery of world famous bays of Hisarönü Bay (44 km). Rest in Hisarönü. Day-6/ Hisarönü-Çamli / Leave the main road and join the back roads of Aegean coast to Çamli Village. Rest in Çinar Houses. Sport shoes and clothes, swimsuit/shorts, sun protection (hat, sun screen ect. ), sun glasses, camera (Do not worry if there is no camera, we will give your digi-pics at the end of the trip). A long journey around Gökova Gulf through 3 famous Aegean towns. This trip is for the ones who can paddle 40 km per day. We use MTBs and follow mostly the back roads. Anyone in relatively good physical condition, who does not have any medical problems, and who has a desire to experience a different side of Aegean Coast. Day-2/ Akyaka-Ören / Bike by the coast to Ören with the scenery of Gökova Bay (40 km). Rest in Keramos Hotel by the sea. Day-4/ Yaliçiftligi-Datça / A short track from Yaliciftligi to Bodrum. 4 hours of free time in Bodrum. Ferry across to Datça at 17:00 o'clock. Pedal 12 km to Uslu Apart by the sea in Datça. Day-5/ Datça-Hisarönü / Follow the main road to Marmaris with the scenery of world famous bays of Hisarönü Bay (44 km). Rest in Hisarönü.